This week’s number in the real world is: Population counts. Knowing how many people live in a town is important. We can infer all sorts of things by knowing the number of people who reside on a particular map dot: number of restaurants, number of malls, number of major sporting events, number of McDonald’s, number of schools, etc. I suspect the answer to each of these items is 0 for Lost Springs. Is one really the loneliest number? The resident of Lost Springs might know. 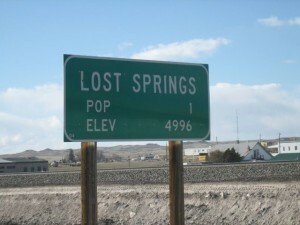 Interesting tidbits about Lost Springs: It’s in WY. In its hey-day (early 1900s), it was a coal miner’s paradise (or if not paradise, a place where coal miners laid their heads down at night). But alas, the coal mine shut down in 1930 and so the coal miners packed their bags and pillows and left for greener pastures and busier mines. According to the 2000 census, the population was 1. However, according to the mayor at the time, that was inaccurate — someone miscounted. The population was actually 4. How can a census worker miscount a town that encompasses .09 square miles and has only 4 people living in it? One of those unexplained mysteries. Let’s hope the 2010 census is more accurate — according to it, there are 4 residents in Lost Springs. No word from the mayor about the accuracy of the 2010 census. Also, no word on whether the sign has changed to reflect the population boom. I took this picture in 2010 (before the 2010 census was released) and I haven’t been back.